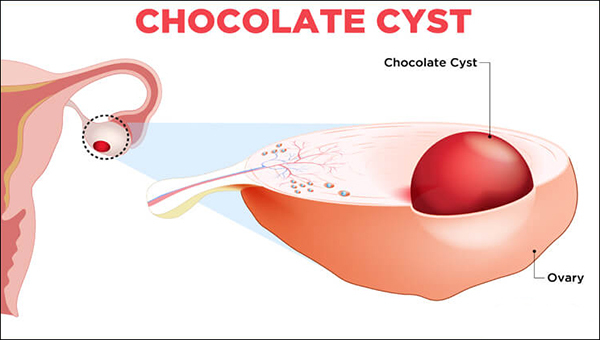 A Chocolate cyst is a fluid-filled sac growing deep within the ovary. The chocolate cyst can be sometimes filled with semi-solid material and thus called complex ovarian cyst. Endometrioma is another name for a chocolate cyst. A Chocolate cyst is an estrogen-dependent disease. These cysts are named so due to their appearance of the dark tar-like material. This material is old menstrual blood and tissues stored within this cyst. Either single or both the ovaries can be affected by these cysts and it can occur singly or may be multiple. The women suffering from chocolate cyst usually are under the premenopausal group. One suffering with endometriosis are more prone to chocolate cyst. Endometriosis is a condition in which lining of the uterus grows outside the uterus. It can grow around ovaries, fallopian tubes or on other reproductive organs. HOW DO CHOCOLATE CYSTS FORM? Menstrual blood flowing back to the body of the women during periods, i.e. retrograde menstruation is the main cause of chocolate cysts formation. Normally due to the fluctuation of hormone women shed their endometrial lining but in case of chocolate cyst some of the blood and tissues flows back and adhere to ovaries and grow there. Slowly and gradually blood collects and forms a cyst. So in cases of endometriosis women have more chances of flow back of blood resulting in a chocolate cyst. These cysts can rupture when more and more blood collect and starts leaking. This can pose as a complication. WHAT ARE THE SYMPTOMS OF CHOCOLATE CYST OR ENDOMETRIOMA? As an individual we all are different. So some women can have severe symptoms at the starting stage while other having the progressive condition can have little or no symptoms. So we cannot co-relate the severity of disease with symptoms. Intake of fertility drug which causes ovulation. Endometriosis as in this condition endometrial cells grows outside the uterus. Pregnancy as corpus luteum develops on ovary may sustain and form a cyst. Any infection that spreads to the ovary can lead to the formation of a cyst. History of any previous ovarian cyst. Though chocolate cysts are non- cancerous but ovarian cysts occurring after menopause can be cancerous. Increased size of the ovary can cause the painful twisting of the ovary which can lead to stoppage of blood supply to ovaries. It can be very painful along with nausea and vomiting. Rupture of the cysts can cause severe pain and internal bleeding. HOW CAN CHOCOLATE CYSTS BE DIAGNOSED? An ultrasound can be used to diagnose the chocolate cyst. Needle biopsy to extract the fluid and then examine using a microscope. HOW IS CHOCOLATE CYST TREATED? If the cyst is small and in its initial stage medicines are given to stop the menstruation cysts do not grow more in size. Secondly, if the size of cyst is bigger and the chances of rupture are more than treatment is surgical, i.e. laparoscopic cystectomy. DO CHOCOLATE CYST HAVE ANY EFFECT ON FERTILITY? Yes, chocolate cyst does affect the fertility severely. In cystic condition there occur scarring over the ovary tissue. Secondly, if a surgical procedure is performed to treat this cyst than it too causes severe scarring of ovary tissue affecting fertility very badly. CAN AYURVEDA TREAT CHOCOLATE CYST? Other than conventional medicines, yes Ayurveda do have a wide range of herbal remedies for the treatment of chocolate cyst. HOW AYURVEDIC TREATMENT IS A BETTER OPTION FOR CHOCOLATE CYST? Conventional treatment for cyst includes intake of oral contraceptives to stop the menstruation, so the size of cyst does not increase. This can cause an imbalance of female hormone and can result in many side effects like postmenopausal symptoms. Surgical treatment can cause scarring of ovary tissue. These all can result in infertility. So this type of treatment along with it brings many side effects too which any patient do not ask for. A gentle, quick and long-lasting treatment. All the medicines are made from natural ingredients. According to Ayurveda imbalance of three doshas (Vata, Pitta and Kapha) in the body leads to chocolate cysts. Accumulation of toxins in the body is the reason for this. At Planet Ayurveda, we are offering treatment for cyst which is 100% natural. All our herbal medicines are made from natural herbs which eradicate the disease from the root. Treatment is gentle, quick and long-lasting. We have an Anti-ovarian Cyst Pack specifically made for cystic conditions of ovaries from purest extracts from herbs. 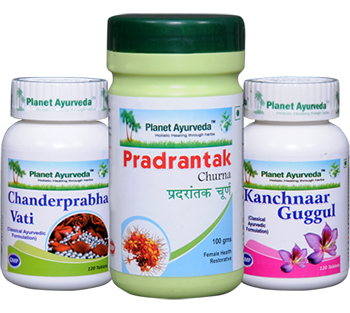 Chanderprabha Vati is an Ayurvedic formulation of Planet Ayurveda. It is being used worldwide because of its effectiveness. It is an excellent remedy which acts as shamak, balya, rasayana and mootral on genital and urinary organs. It is a herbal supplement which maintains the well beings as a whole. Dosage: 2 tablets, twice daily with plain water after meals. It is one of the best herbal formulations for all types of female health problems like menstrual irregularities, ovarian cysts, and leucorrhoea. It balances the disturbed female hormones. It supports and maintains female reproductive health. Dosage: 1 teaspoonful, twice daily with water after meals. The guggul word has its origin from a word of Sanskrit meaning guggulu which means protection from disease. It is a very effective herbal combination of kanchnar and guggul. It acts promptly in any case of hormonal imbalance like ovarian cyst and pcos. It supports and maintain health. Dosage: 2 tablets, thrice daily with plain water after meals.